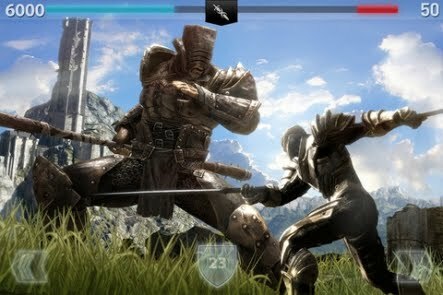 Infinity Blade II is now available on the App Store. After introduced last October at the Let's Talk iPhone, the game is back showing off the chart that is used both in mobile gaming devices and other iOS based on Unreal Engine 3 code base. Although the game is compatible with the iPhone 3G, iPad 1 and iPod Touch third generation (32GB & 64GB), but the Infinity Blade II game is more advisable played on the iPhone 4 or above and the iPad 2, where the two devices that have a dual-processor chip and and higher graphics capabilities. For now the Infinity Blade II games available exclusively only for the iOS platform users. Epic as the manufacturer of this game highly recommend playing the Infinity Blade II in IOS 5. the Infinity Blade II game is sold at a price of $7. For parents who do not want the bill because they conceded their children purchase items in this game, there is the option to disable the feature in-app purchasing. Blade II is one of the best games that I've played and I was very excited to see it in the AppStore. Played it in the iPad2 and I was awed withe the game play, graphics and storyline.